Okres tuz po wojnie. Roza, mloda zona Juliusza Zborskiego, nie wierzac w mozliwosc powrotu meza z obozu koncentracyjnego, uklada sobie zycie od nowa ze swoim zwierzchnikiem, profesorem Stegieniem. Zwiazek ten zostaje zerwany, gdy niespodziewanie w domu pojawia sie Juliusz, chory, wyniszczony obozowym zyciem. On jednak, bedac juz tylko wrakiem czlowieka, odrzuca litosc Rozy i popelnia samobojstwo. Posepny dramat psychologiczny analizujacy moralne skutki wojny, ktore beda trwac znacznie dluzej niz jej widzialne, zewnetrzne pozostalosci - ruiny i zgliszcza. Cast: Lucyna Winnicka, Roland Glowacki, Janina Sokolowska. 1957, Black & White, 85 mins. 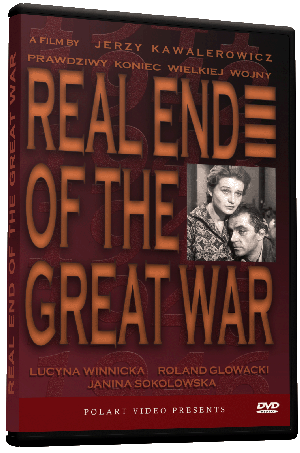 Real End of the Great War (Prawdziwy koniec wielkiej wojny) is a drama about the mental scars people carried with them after World War II. Most of what my relatives in Poland lived through during WWII was considered too painful to retell and I can only guess at what it was they lived through. This film is, without a doubt, one of those stories about such painful experiences. Even Juliusz, the man the story is about, keeps his experiences from his family. Since Juliusz returned home, he doesn�t say a word, not ever, to anyone. His wife Roza struggles with interacting with him. He isn�t the man she married before the war and while he was missing, she met someone else. Her heart is torn between loyalty to the man she married and her new life. She sneaks off at night to spend time with her lover, while her husband, a broken man, stays home. He knows what is going on, but putting an end to it would be a great challenge to any man. We slowly learn what happened to Juliusz when he does his spinning dance, which others consider to be a fit or mental breakdown. When he spins, he is brought back in time to when he was at a concentration camp. The flashbacks he has are haunting and memorable. I found these flashbacks to be the most dramatic part of the movie. It is difficult to be disappointed by any of Jerzy Kawalerowicz�s films. In my opinion, he ranks among the best Polish directors of all time and all his films are worth watching. Younger audiences may best remember him by his last movie, Quo Vadis?, which was an epic big-budget production. Real End of the Great War is a drama that gives me chills; although it is tragic, it is a beautiful film.